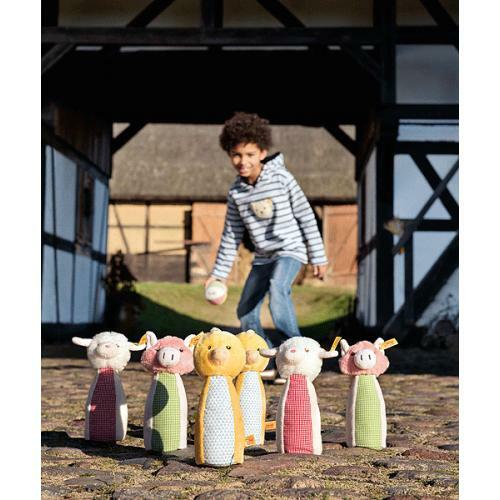 Steiff Happy Farm Skittles Set of addorable soft toys to play Skittles, is hand made of beautiful soft multicoloured plush for a baby's delicate skin. Each of the seven items in this set, carries the famous trademark, Button in Ear. 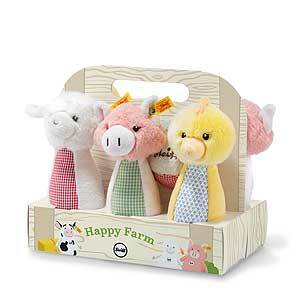 The Happy Farm skittle play set encourages babies and toddlers in coordination and concentration. It consists of six skittles and a ball. Each piglet, chick and lamb comes with a friend. It is suggested, a hard-wearing felt mat provides a stable surface for the skittles to stand on. Just stand the skittles up and your child can start practising to throw the ball. The colourful skittle set is supplied in a wood-effect cardboard carrying case.